The United States Congress, in a dignified ceremony at the US Capitol on November 2, 2011, presented the Congressional Gold Medal, the highest civilian honor the nation can bestow on an individual or organization, to the men of the 100th Battalion, 442nd Regiment, and MIS. Over 350 veterans, many in wheel chairs, came to Washington, DC for this event. 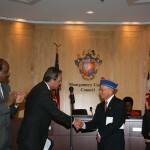 Grant Ichikawa, MIS veteran who served in Australia, Philippines and Japan, accepted a copy of the Resolution on behalf of all 100th, 442nd and MIS veterans residing in Fairfax County. Standing with Ichikawa were two MIS veterans, Fred Murakami, former President of Japanese American Veterans Association, and Yukio Kawamoto. Sharon Bulova, Chairperson of the Fairfax County Board of Supervisors and sponsor of the Resolution, praised the Nisei for their courage and determination to prove Japanese American loyalty to their nation. She also cited the perseverance of ethnic Japanese who were involuntarily confined in internment camps during World War II. Following the presentation, the Council invited the veterans, family members, and friends to an elegant reception in a room near the Supervisors’ chamber. 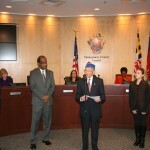 Mr. Terry Shima, 442nd veteran who served in Italy, accepted the Proclamation from County Executive Leggett and Council President Berliner on behalf of 100th, 442nd and MIS veterans, widows and families who reside in Montgomery County. 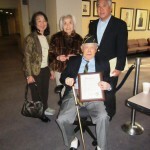 Council President Berliner read the one page Proclamation, which described the wartime experience of the honorees, which included both Japanese American and Caucasian officers. Ichikawa and Shima presented appropriate remarks to thank the respective county governments for these recognitions. The presentation ceremonies at each event were attended by about 50 persons. 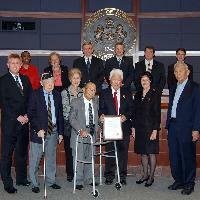 Resolution in Fairfax County, Virginia to honor Nisei CGM recipients on November 20, 2012. Resolution event. Fairfax County, Virginia. Resolution event, reception. Fairfax County, Virginia. 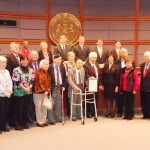 Video: Recognition by the Fairfax County Board of Supervisors of the Congressional Gold Medal awarded to the 442nd, 100th, MIS units of the Japanese American Veterans of WWII. 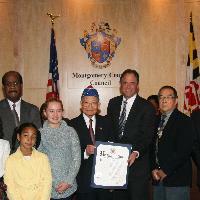 Proclamation in Montgomery County, Maryland to honor Nisei CGM recipients on November 27, 2012. Presentation of Proclamation to the 100th Battalion, 442nd RCT and MIS. 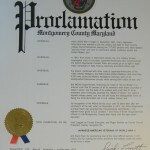 Terry Shima’s remarks, Montgomery County, Maryland, November 27, 2012.